I know I've been on a total Roxie streak lately in my projects so today I thought I'd best show something else before I start getting questions about whether I even own the other packs! Yes, yes I do - and yes, yes I love them too! Sonoma with the purple and green colors (always a sucker for those) and the lovely floral/paisley combination is such a beautiful pack and just right for heritage or vintage projects. Don't you just love all the cameos that are popping up everywhere? 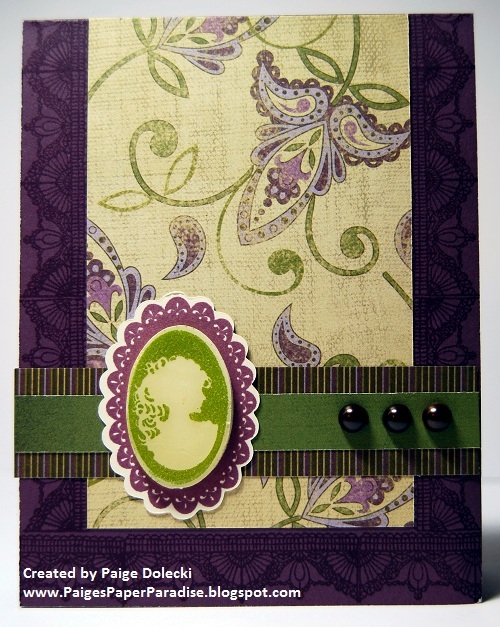 To make this one I used our Olive embossing powder and layered it with Liquid Glass to give it more of a vintage feel. The gorgeous lace stamp around the card edge is one of my new favorites - so beautiful done tone on tone but I can't wait to use it with white pigment ink to really make it look like lace!